We wanted to find out, so we surveyed 74 diverse LMS vendors about the social learning functionality available in their platforms. We targeted the LMS vendor community because these organizations have a vested interest in developing and supporting only the features they believe the market wants and they know they can sell. What’s Going on with the Social Learning LMS? Technically, social learning features were built into learning management systems long before social media was invented. In the 1990s, the social LMS feature set included threaded discussions, coffee groups, collaboration centers, forums, FAQ and chat — typically occupying a seldom-used tab in the navigation menu. In reality, this social LMS feature set was all sales sizzle. Social capabilities were underutilized, mainly because no one understood how to deploy, promote and support them. Common logic was flawed — assuming training professionals and subject matter experts (SMEs) would regularly visit these social “spaces” and interact, keeping content fresh and learner engagement high. Unfortunately, content quickly became stale and learning interaction ceased. With these LMS features, organizations have an opportunity to create and sustain learning communities around virtually any topic, course or idea. More importantly, people can leverage all the social behaviors they apply elsewhere to the process of learning. However, there is still tremendous room for improvement in designing and deploying social LMS capabilities. “Best practices” are still very much a work in process. The large Talent Management providers are retaking a serious look at useful social learning after losing many pure LMS opportunities to the socially focused cloud LMSs. For example, when finalizing this post I became aware of the new SAP Jam collaboration learning platform. SAP is attempting to inject social learning into their platforms to adapt to the new way learners want to learn. The big talent LMS providers have been late to the social party– mainly because they focus only on employee development and not extended enterprise solutions where the social ROI is more evident. With the recent announcement by Workday to release their own socially enabled LMS the other Talent providers are now following suit. The behemoth laggards are finally back to investing in learning innovation. In addition to conducting our LMS vendor survey, Talented Learning has also conducted over 100 in-depth LMS reviews in the last two years. We have documented all the social features we encountered and divided them into two groups: basic and advanced complexity. 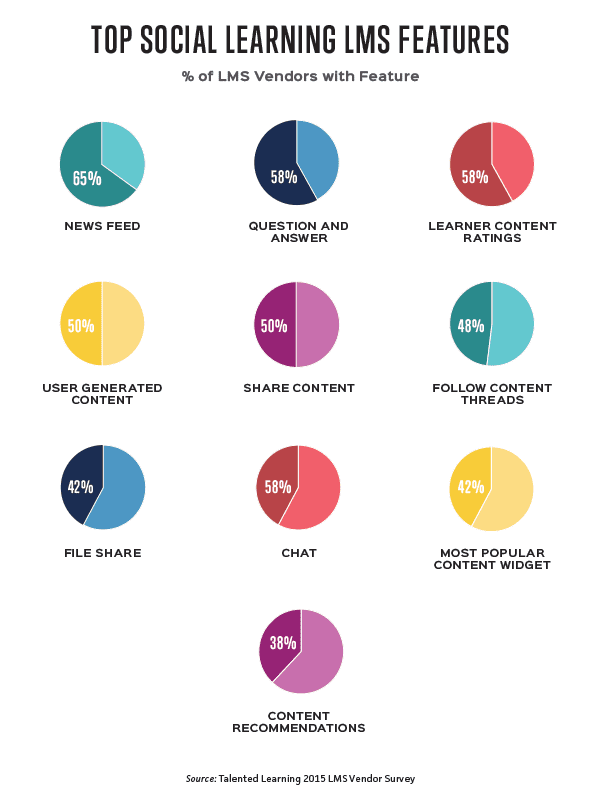 Use of mainstream social media has been the guiding force for social learning LMS relevance. New and progressive cloud LMS providers have been integrating the best of social media features with social learning — and guess what? It’s working. These features don’t replace popular social channels and tools nor are they intended to do so. However, with more sophisticated social capabilities integrated into LMS platforms, organizations are finally able to create sustainable learning communities within an LMS environment. And that means the long-awaited benefits of more continuous, holistic formal and informal learning are beginning to be realized.